From the dreaded “Freshman 15” and unhealthy eating habits, to all-night study sessions and occasional cases of homesickness, it can be hard to stay healthy at college. To help students learn about making better choices, Student Health Services at The Health Center will hold its annual fall HealthFest on Tuesday, Sept. 22. The event will feature free food, giveaways and activities to help promote a better campus lifestyle. It will run from 10 a.m. to 2 p.m. at the Potomac Lounge in the University Union. The Health Center will offer free massages and acupuncture sessions from 11 a.m. to 1 p.m.
Over 40 different interactive stations and tables. Along with the different events, there will be several giveaways, including a Fitbit, a wellness basket, a gift basket from the UStore, a “Snack Survival Kit” from Trader Joe’s, a personal training session from Campus Rec and a free half-hour massage from the Health Center. To be eligible to win, students will receive a “passport” with the eight dimensions of wellness when they enter the fair. As students engage in the fair activities, they will earn stickers from the various tables representing the dimensions. 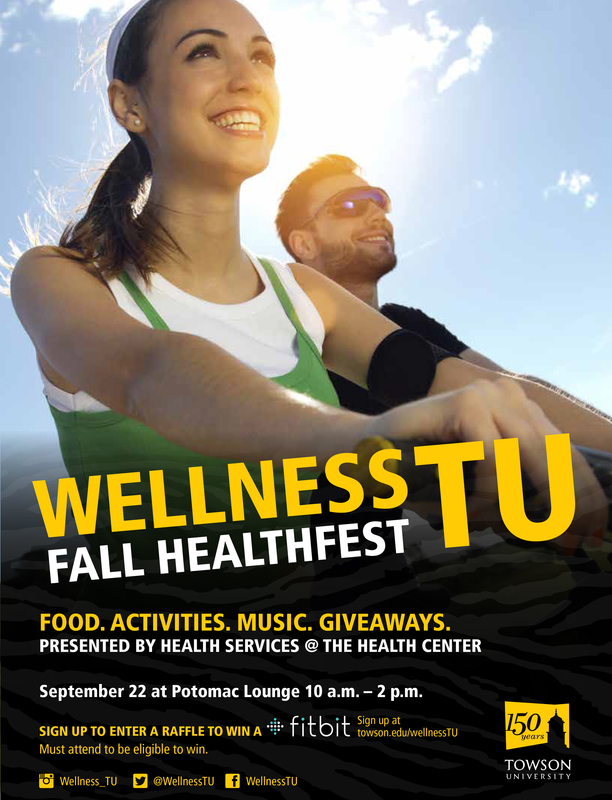 Register for the event at towson.edu/wellnessTU, though registration is not required for attendance. Students who do register will be given a second entry into the FitBit giveaway. For more information, visit the TU Wellness Homepage, or the TU Wellness Facebook page.